The Mick Taylor prequel novel Origin ships to stores next weekend, but there’s a way you could get your hands on a copy before everyone else. I’ve decided to give away one of my personal author’s copies (from a very dwindling supply) to a follower of my Facebook page, personally inscribed by myself. Unless you’re a critic, or were one of my family at Christmas, this is the only way you’ll get your hands on a pre-release copy (signed and everything!) because this is the only competition anyone’s running. How exclusive is that? Head on over to facebook.com/aaronsternsauthor and like/follow my page and you’ll be in the hunt! On New Year’s Day I’ll be letting my baby daughter choose one of my followers at random (I’m not sure how she already knows how to use a mouse). I’ll message the winner Wednesday night, and then express post the book out the next day. Unless you’re overseas it should hit you by Friday, and you can’ve read it before the stores even stock it (though I’m not promising anything — but, hey, they won’t have signed copies, will they?). And if you don’t win, never fret because the book’s very reasonably priced (in this day and age of $25-30+ books) at just $19.99 for the paperback, and $9.99 for the e-book. Nice pricing Penguin. See where Mick got the whole head-on-the-stick idea. Hint: it’s pretty gross. Congrats to Matthew Black of Parramatta in NSW for winning the copy. 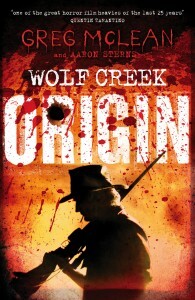 I’ll be giving away a couple more random copies in the leadup to Wolf Creek 2, so stay in the hunt at facebook.com/aaronsternsauthor.